Over 30 years in St Louis! Our Android & iPhone App Coming Soon! Accurately conveying communication between spoken English and ASL. Interpreting English into signs – following English grammar. Working with people who have a range of both vision and hearing loss. Repeating the spoken message making it as easy to lip-read as possible. We truly care about our users and our services. Since 1988 Deaf Inter-Link has been the leading provider of Sign Language interpreting in the midwest region. Located in St. Louis, Missouri, we are committed to providing the highest quality interpreters for our local clients as well as our national customers. 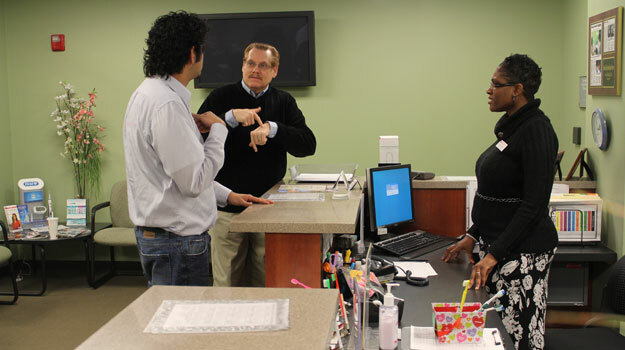 We offer a full range of interpreting services for the deaf community. Our agency believes in finding the most professional and highest qualified interpreters to represent our company.